A minor disagreement between two men – one Christian, the other Muslim escalates into a nationwide controversy. This Oscar winner plunges into the thicket of Lebanon’s sectarian divisions with a riveting courtroom drama that shows how even minor interpersonal tensions can boil over into national traumas. While the issues it engages are timely and important, the film’s claim to fame really comes from its terrific accomplishments on every front, from writing and directing to acting and cinematography. Lebanese director Ziad Doueiri, who studied in the U.S. and served as Quentin Tarantino’s camera operator on Pulp Fiction, has been an important voice in Middle Eastern cinema since his autobiographical debut West Beirut (1998). Like his 2012 terrorism-themed drama The Attack, which he filmed in Israel and was duly arrested in Lebanon for that act, The Insult shows that he’s a skilful and gutsy filmmaker who is not afraid to venture where others fear to tread. 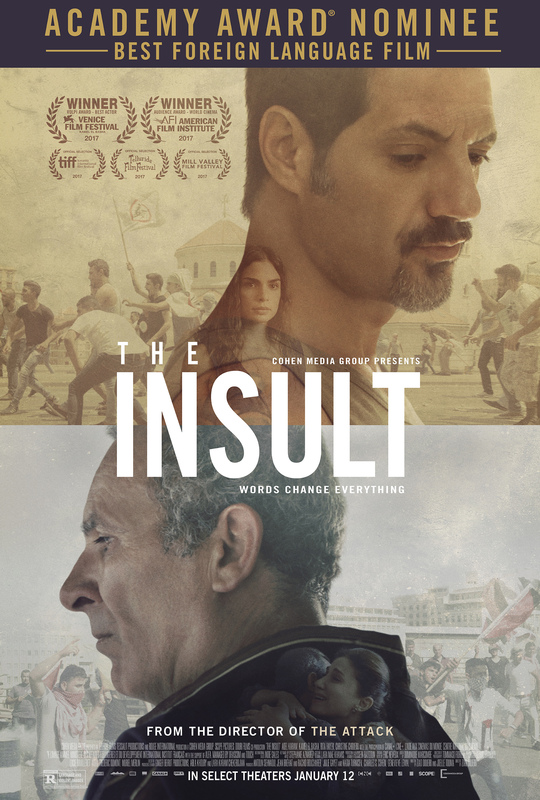 One can learn a lot about these groups and contemporary Lebanon from The Insult, but it’s also possible to go into the film knowing little about the situation depicted and still come away completely captivated. That’s because the conflict at the drama’s centre is so personal, visceral and universally recognisable; it could take place in Mississippi, Beijing or Bogota. The film’s title might actually have been plural, since its story depicts a cascading series of insults. One man shouts an insult at another, who’s infuriated and demands an apology. The other man is urged by his boss to apologise so that everyone can move on. Initially he seems inclined to do it, but when the time comes, he’s unable to. Soon things escalate and the men end up in the first of two courtrooms where they will face off against each other. Does it matter that Tony is a right-wing Christian and Salameh a Palestinian? In this context, it matters a lot. In the early scene where Tony slams his door in the face of a man who’s offering him some free help, there’s no mention of religion, ethnicity or politics; but when you think back on it, you can easily surmise that Tony wouldn’t have done this if he’d been addressing a fellow Christian. When Salameh goes to Tony’s garage to apologise, the TV is blaring a right-wing Christian politician lamenting the presence of Palestinians in Lebanon. As the conversation quickly dissolves into hostility, Tony snarls, ‘I wish Ariel Sharon had wiped all of you out,’ meaning the Palestinians. For that, Salameh hits him in the gut, assuring that the battle will have a bitter future in the legal arena. By the time their second trial happens, each man has become a cause for their respective people. Tony is represented by a large legal team headed by a famous Christian trial lawyer named Wajdi Wehbe (Camille Salameh). Salameh’s defense, meanwhile, is mounted by Nadine Wehbe (Diamand Bou Abboud), a brilliant young attorney who seems to exemplify the opinion we hear that it’s ‘trendy’ for liberal and left-wing Christians to take up the Palestinian cause. She is also, not incidentally, Wajdi Wehbe’s daughter. With their combination of personal and political animosities, the film’s highly charged courtroom scenes prove both riveting and revelatory. Much of their power obviously results from Doueiri’s skills as director. No doubt having started out as a camera operator gave him a sharp sense of visual style, because his fluid camerawork is both precise and endlessly dexterous. The four lead actors are all superb while the supporting cast includes some striking performances. Altogether, the accomplishments of The Insult place Doueiri in the company of such masters of politicised suspense as Costa-Gavras and Asghar Farhadi. A great director already, he is surely one to watch in the future.